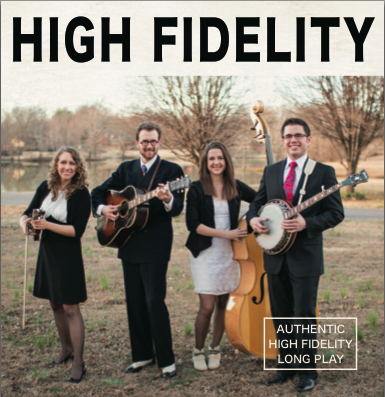 Traditional bluegrass band High Fidelity has just released their debut album. The self-titled release features 13 tracks of straight-ahead traditional bluegrass. The record for the most part showcases the band in four-piece fashion, with Jeremy Stephens on guitar and vocals, Corrina Rose Logston on fiddle and vocals, Kurt Stephenson on banjo and vocals, and Vickie Vaughn on bass. Mandolinist Daniel Amick contributes on a handful of selections. All songs were cut live in one room with minimal isolation, similar to how recording was done by the first generation bluegrass pioneers whom the band draws its inspiration from. High Fidelity formed in 2014 and won the 2014 SPBGMA International Band Championship. They are performing a select number of dates in 2016. For purchasing information on their new album, contact High Fidelity at highfidelitybluegrass@gmail.com. Visit High Fidelity on Facebook at www.facebook.com/highfidelitybluegrass and on Twitter at www.twitter.com/highfidelitybg. Words cannot describe how honored and beyond excited I am to be making my Grand Ole Opry debut this Saturday, February 20, 2016, at 8:15 pm CST with one of my all-time heros, Jesse McReynolds. Jim & Jesse have always been my favorite bluegrass group ever since I can remember. When I was 3 years old, I sang along with their In the Tradition record every day on my way to and from 3-year-old preschool. When I began playing fiddle, I dreamed of playing the Opry as a Virginia Boy, and thinking about it made me practice harder. To say this is a dream-come-true is almost an understatement. Feel free to tune into 650 AM or www.wsmonline.com Saturday, February 20, 2016, at 8:15 pm CST and join me!!! I’m so unbelievably excited to release my first ever official music video!!! It has been a while since I’ve focused on writing, but sometimes God has a way of bringing you around. When God gave me this song, I immediately had a strong urge to get into a studio and put a video out of it. I’d never done a video like this before, but everything just fell right in place for it to happen — and here it is! The video features a stellar cast: Jeremy Stephens, Casey Campbell, P. J. George, and Kevin Buchanan in the band; Richard Smith of Tunesmith Studio heading up tracking; and Brad Benge behind the knobs of the audio/video editing/mixing/mastering. These guys all did an amazing job, with a special shout out to Brad Benge — I’ve been bandmates with Brad and played and sang with him in a variety of situations, but this is the first time we’ve worked together in this way, and he is an awesome creative force to work with! Lord willing, this will be the first in a series of videos from the tracking session that day at Tunesmith Studio — a series I’ll be referring to as the Tunesmith Sessions. All of the songs were tracked and filmed live simultaneously, with the videographer right in the tracking room with us as the songs were going down! It’s all pretty exciting!! !